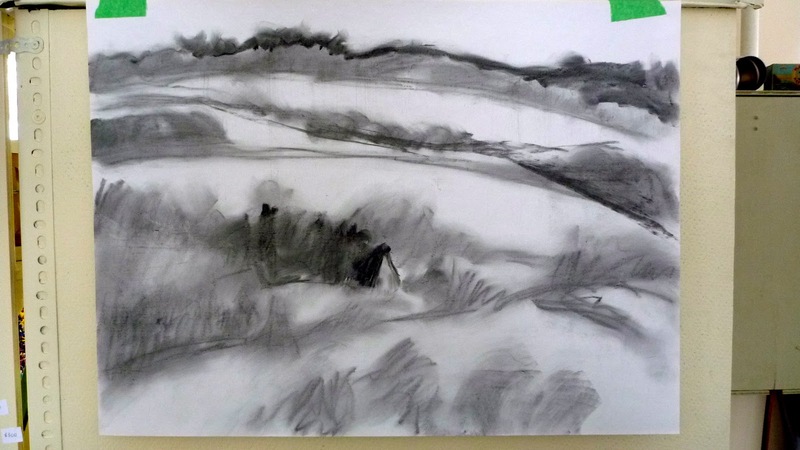 Charcoal sketch of field patterns. It’s absolutely gorgeous outside right now. 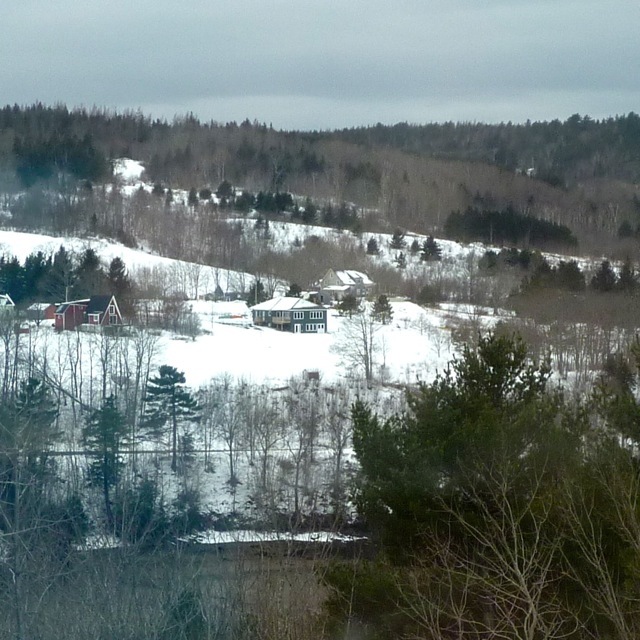 There is a thick blanket of snow covering the fields, and the hills. With all the leaves gone it is really easy to see through the trees to the hills on the other side of the river. What I see is long stripes of trees that border fields, slashed diagonally by roads that wind their way down the hills. Looking from the Annapolis side towards Riverview Road. The colors now are so muted that it is a challenge for a color-loving painter like me to actually paint that scene in a monochromatic way. 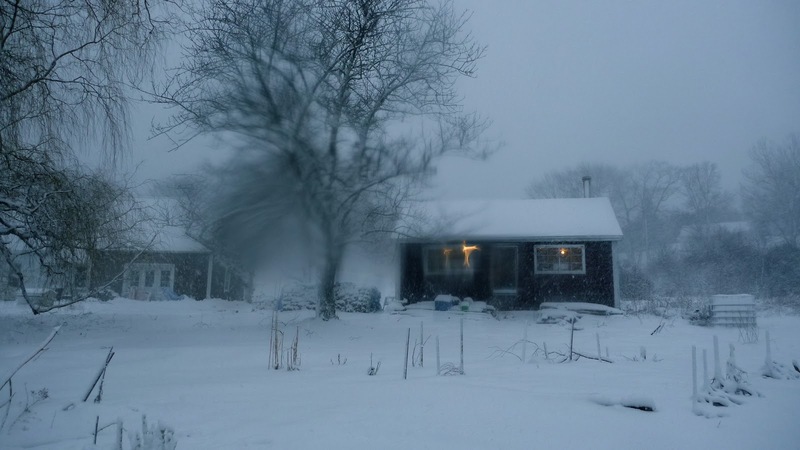 in fact it would be easier for me to use brilliant colors to depict the snow scenes around me–but I want to try an abstracted approach using muted colors. 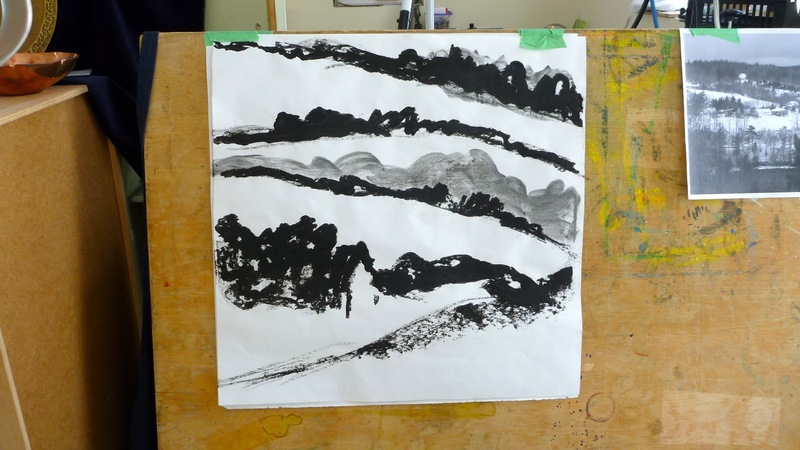 I start with charcoal drawings to get a sense of the shapes in the distance. 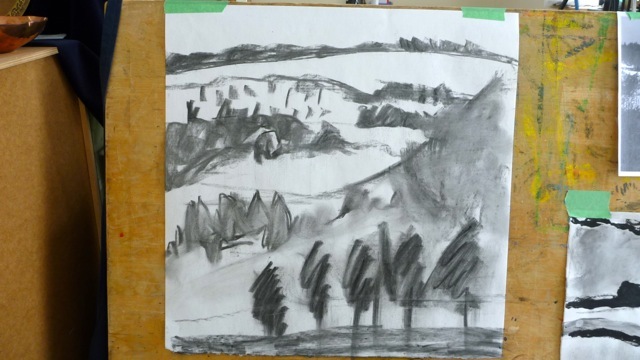 Charcoal sketch of snow scene. Larry is immersed in creating a pendant and is listening with me to a podcast from This American Life about the fictitiousness of money, starring the Federal Reserve. 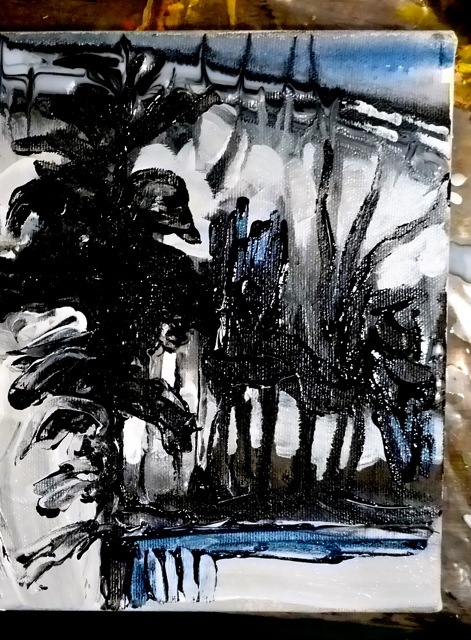 I discovered, quite by accident, that if I put my paper on top of the hot wood stove, and draw on it with crayon that the wax melts instantly and leaves a very dramatic line.This must be what encaustic painters experience! Melted crayon on paper and charcoal. 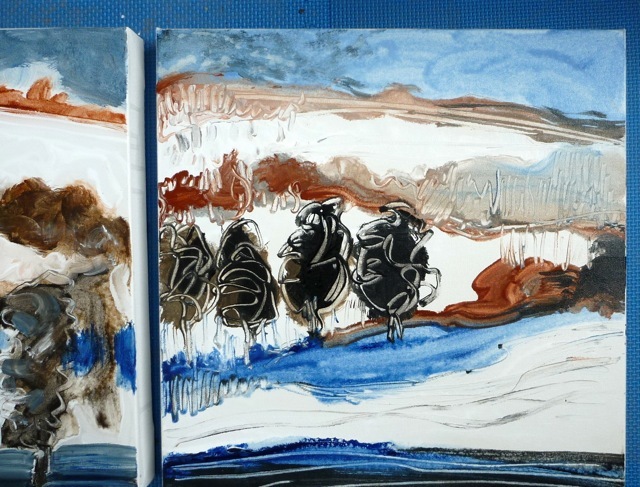 These canvases are 16″ x 16″. I’m using fluid acrylics mixed with matt medium. This one was my favorite as far as the intensity of colour. I rarely use burnt umber and I never use black. In fact I hardly ever use white either. So all of these choices amount to a complete departure for me. But I was determined to give it a try. This was my favorite of the 3 canvases as far as paint texture goes. 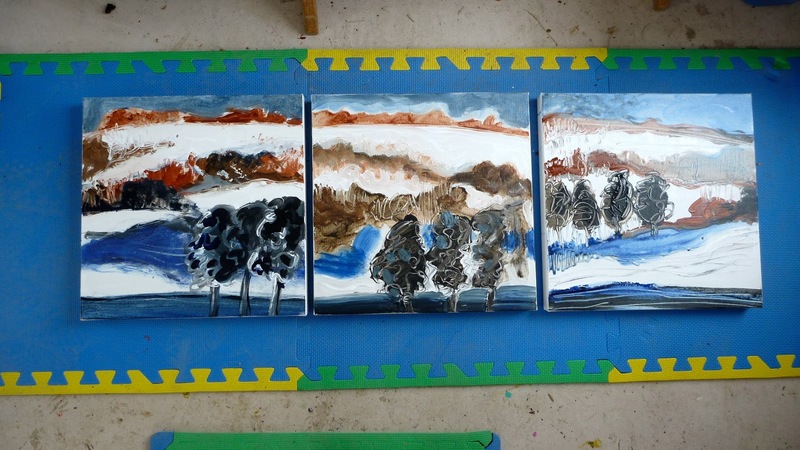 I will work on them tomorrow with the objective to create a more harmonious look and feel to the 3 canvasses. Although I really like the intensity of the colour, it is more than I intended. But, a reduced colour seems to go against my very nature. I may try to mute things anyway. Stay tuned! 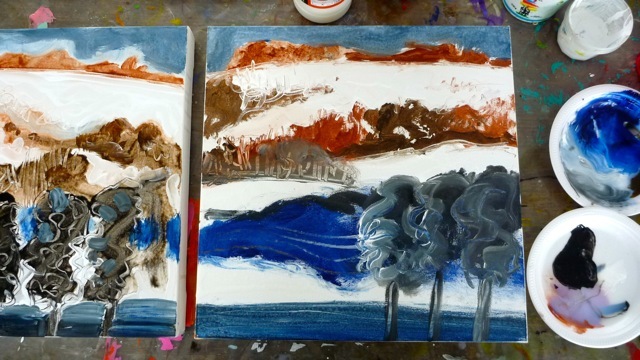 Canvases drying on my new cushioned mats. (I stand when I paint). This is a good exercise to work on while winter is upon us! The studio is like a giant playroom for Larry and me. WOW! Flora this is a fascinating post! You are an absolutely amazing, multi talented being – both of you – Larry included! it all seems to pour out of you!!! 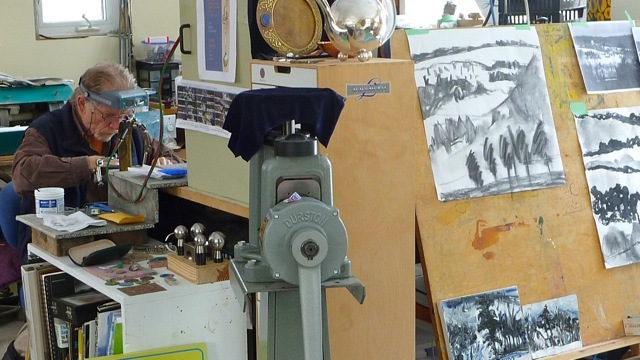 Marcia, we both feel so lucky to be able to create….it's amazing how many diversions there are inspite of the 'ideal' surroundings. Thanks for your comment!